Nottinghamshire has been lucky to have had several good breweries within its boundaries. Water from the River Trent has played a vital role in the brewing industry in the county, both in terms of using the water as an ingredient and also transporting the finished item. The earliest written evidence of activities of brewing is in a record of 8 October 1395 in the Records of the Borough of Nottingham where a complaint is made about the assize of ale. In fact in the Victoria County History section on Malting and Brewing there are a number of references to complaints about the purchase, sale and manufacture of malt and ale in Nottingham, Newark and East Retford. The earliest record of a brewery is Greens Brewery in Butchers Close (Lower Parliament Street and London Road). The barley grown in the Vale of Belvoir was excellent and a ready source for the brewers. Thoroton stated that brewing was at its height in the times of Cromwell. Today there is no difference in terms of beers and ales but in the sixteenth and seventeenth century the use of hops for flavouring was not always approved and the term beer was applied to hopped products, ale was brewed without hops. Porter was a dark beer, so called because, “… the labouring people, porters etc, experienced in wholesomeness and utility, they assumed to themselves the use thereof, from whence it was called Porter.” Small beer was so called because in the 17th century two classes of beer were made and for the purpose of taxation, strong beer was two shillings a barrel whereas, small beer was taxed at sixpence a barrel. Former malthouse in Worksop (photograph courtesy of Jane Sumpter). The distinct craft of malting is indispensible to the brewer who was the customer of the malsters but from the middle of the nineteenth century some brewers made their own malt whereas some continued to buy. In the north of the county malting barley so it could be brewed into beer was important in Worksop, although it never employed many people. The trade had begun in Retford but had gradually been superseded by that of Worksop, which at one time paid £50,000 to the Excise. In 1852 Clinton malt kilns were erected at Worksop. At first the work was seasonal but when grain could be transported by train this meant it could be brought from further afield and the malted barley could be sent further away, thus extending the malting season to nine months a year and employing more people. The Worksop and Retford Brewery was trading before 1877 as Garside and Alderson and thereafter Prior Well Brewery. In 1881 the name Worksop and Retford was registered and the company had 200 tied houses. In Newark before the 17th century people brewed their own beer; a job carried out by the women of the household not only in Newark but in the rest of the county. Court rolls make reference to ‘common brewers’. After the 17th century more brewing companies began to make their appearance and by the turn of the 18th century the town had gained a reputation for producing good beer. Celia Fiennes, a diarist and traveler stated, “I met the strongest and best Nottingham ale that looked very pale but exceedingly clear”. Three main factors contributed to the development of Newark as an important brewing centre; a flourishing and long established malting industry with easy access to high quality barley supplies. Malting had been well established since the mid 18th century and the last malt to be made in the town was in 1980 at Pearl’s Malting in Northgate; the town’s location to the River Trent with easy access to a network of inland waterways, coastal ports and overseas trade and finally the availability of exceptionally prime supply of water containing the exact amount of calcium sulphate (gypsum) comparable to Burton on Trent, an excellent brewing town. 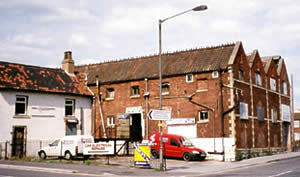 Northgate Brewery, Newark on Trent (2005). Newark‘s longest lived brewery had its origins in Handley and Sketchley’s Town Wharf brewery. The partnership of these two men; Sketchley who had brewing knowledge and Handley who was a local banker, began circa 1766 and developed into the largest brewery in the town, Warwicks and Richardson’s, Northgate. Whilst the brewery was still owned by Handley the VCH notes that the trade with the Baltic was considerable and that Catherine of Russia was partial to stout which was exported largely from Nottinghamshire. In 1856, Richard Warwick, whose father, William, had been manager of the Handley’s Newark bank, purchased the Handleys’ brewing interest in the town. The Town Wharf brewery was by this time run down but Warwick could see its potential and with his eldest son continued to trade from the brewery until 1872. He had previously bought one and half acres of land on Northgate upon which he built a small malting. The site was eventually extended to about 11 acres and in the 1870s the Northgate Brewery was begun and the first brew took place on 14 September 1872. Warwick senior died in 1877 and left his eldest son as senior partner in the firm and in 1888 the business was incorporated as Richard Warwick and Sons Ltd, as another son had become a partner. In 1890 Warwick’s took over Trent Brewery which had been established in 1857 on Millgate by Richardson, Earp and Slater. The newly amalgamated breweries were called Warwicks and Richardson’s Ltd. Over the next fifty years the company took over several breweries both in Newark and elsewhere. These included The Newark Brewery, which had been going since 1869 and Albion Brewery in 1892; Stones Home Brewery, Peterborough in 1897; Alma Brewery, Cambridge, in 1911 and Brampton Brewery Co Ltd, Chesterfield in 1955. At the time of being incorporated in 1890, Warwicks and Richardson’s employed 133 people including 93 in the brewery and 40 admin staff. In 1962 Warwicks and Richardson’s were themselves taken over by John Smith’s, Tadcaster Brewery Co Ltd and ceased brewing in 1966. Smith’s was itself taken over by the Courage Group, who in turn was incorporated into Scottish and Newcastle plc. During the period under Courage brewing was transferred to a new site on Jessop Way, Newark. As with many breweries their offices were show pieces and we are fortunate to have some of the buildings still standing which offer an insight into the glory days of brewing. The Warwick and Richardson’s building in Northgate was designed by William Bliss Sanders, South Kensington and built by Mr Baines of Newark. 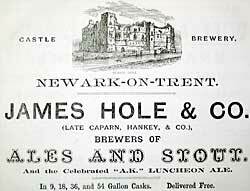 The other major brewer in Newark was James Hole and Co Ltd. It began life as the Castle Brewery in Albert Street circa 1870 and was owned by Caparn and Hankey. James Hole bought the brewery in 1885 and built a new brewery in 1890. This too met its demise in 1968 when it was taken over by Courage and later John Smith’s. The last brew was in 1982. Once again the building has a beautiful fascade and is an imposing building even today. It has ‘H & Co’ in diamond bricks on three gables on the side elevation and Castle Brewery on the front elevation above the door. 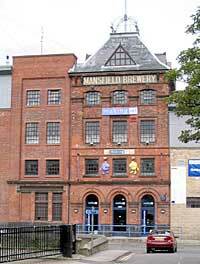 Mansfield had a thriving brewery which began in 1855 on land that was once a part of the North Notts Coalfield. It was no doubt the proximity of these coal mines that assisted in the forming of Mansfield brewery in 1854. William Baily, a gentleman farmer, Samuel Hage, also a farmer and John Watson from Sheffield, a brewer established the company and became partners in 1855. Only two years later Watson sold his share of the business for £450 and left the remaining two men to run the business. They diversified into malting, under the firm of Hage and Baily, as well as concentrating on the production of beer. Nearly a decade later Addison Titley had to pay £2,000 to be admitted into the partnership. He had been a partner in a malting company, Shacklock and Titley, the other partner, Shacklock, was the cashier at the Mansfield Brewery Company. By this time conditions for the growth of the brewing trade was improving rapidly; there was a significant growth in population, a growth in the number of coal mines and increased railway transport in the region. Titley brought a much needed new, younger approach. He was rewarded by being given a share in the brewery in 1873. In 1874 William Baily died, the following year his nephew, William Jackson Chadburn joined the company as a Brewer’s clerk. He was to later take a significant role in the running of the brewery over the next couple of decades but did not become a partner until 1885. During these ensuing years the company flourished and was run by Titley and subsequent members of William Baily’s family. A new Mansfield Brewery partnership was established in 1885, including William Edward Baily (heir to the late William), Henry Shacklock, William Jackson Chadburn and James Handley Hopewell, who had run a successful wines and spirits business. During the next few years the brewery bought a number of pubs which were then used as an outlet for their beer. At the turn of the century Chadburn became the Mayor of Mansfield and when Shacklock died his shares were bought by William Edward Baily. Chadburn increased his grip on the brewery on the deaths of Hopewell and William Edward Baily as he bought their shares and by 1904 owned one third of the partnership. Mansfield at this time was generally agricultural, surrounded by some great landowning families; the Portlands, the Devonshire and the Rutlands and was already a significant malting centre. As well as agriculture, Mansfield was known for quarrying stone used in the Houses of Parliament and St Pancras Station, as well as the textile industry. However with the further development of the coalfields there was an increase in the consumption of the local beer to such an extent that re-building of some old pubs in the surrounding area of Mansfield was required much to the consternation of the Liberal Nonconformists who saw the public house as a place of trouble. An even greater decision was whether to build a new brewery because put simply the old brewery had come to the end of its life. After much debate and consideration of the finances available to be spent work began on the new brewery, designed by William Bradford & Sons in 1907 and production increased from 17,000 to 20,000 barrels per annum in one year. At this time Chadburn had been the steering the company with the help of Edward Addison Titley (son of Addison Titley) but by 1912 histwo sons become share holders and he reduces his shares in the company. The company survived the First World War and continued to increase their production of beer. Chadburn and Titley died within one year of each other in 1922 and 1923 and two years later the company ceases to be a partnership and becomes a Limited Company, Mansfield Brewery Ltd. with Chadburn’s eldest son as chairman. By 1935 it became a Public Company and takes over Chesterfield Brewery which had over 100 public houses. The years leading up to the Second World War saw various management changes but the company was steered through the war and emerged unscathed and continued to be a profit making firm until the 1950s and 1960s. The 1970s saw some changes; the end of the wooden casks and a new kegging plant fully operational in 1973, ‘Marksmans’ lager was introduced in 1975 and the company failed in a bid to buy Shipstones brewery in 1978. Once again the 1980s saw the brewery profitable and at the end of 1981 an announcement was made to build a new brewhouse on the old loading stage site; in 1982 the company launched a beer advertising campaign featuring Ronald Regan and later Mikhail Gorbachev. In comparison to the other main breweries in Nottinghamshire, Mansfield Brewery had more than fifteen extra years of production and Mansfield was awarded the contract brewing for all Home Brewery products following their take over by Scottish & Newcastle and the closure of the Daybrook site. In 1997 profits were still increasing and a new beer, ‘Redeye’ was launched. Despite the company being one of the Midlands’ most successful and spohisticated independent businesses the battle to save the brewery, which had been long and complicated, was lost to Wolverhampton and Dudley’s offer won and in December 1999 the company ceased to be a independent firm. The last day of brewing before it went to Wolverhampton was in 2001. Unfortunately the once proud site has been left to crumble and the brewery chimney which had dominated the Mansfield skyline for more than 150 years went down in three seconds in July 2008! The famous ‘M’ sign which advertised the brewery is now housed in the Mansfield Museum. 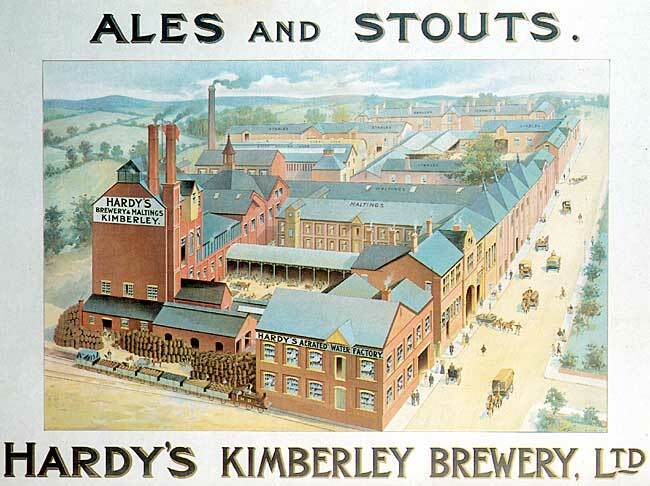 In Kimberley, north-west of Nottingham, the two major breweries were Hansons Ltd and Hardy’s Kimberley Brewery, sited opposite each other along Brewery Street and Hardy Street. In 1832 Samuel Robinson, a craftsman brewer rented an old bakehouse in Cuckold Alley and sited his brewery there. This was a particularly good site as it was supplied with water from two sources; Alley Spring (Hardy Street) which gave the brewed beer a unique taste. He was so successful that he attracted brothers William and Thomas Hardy, who had made a success as wholesale beer merchants and had put in an offer in 1857 for Robinson’s Brewery. They built the business up and bought more land and employed an architect from Burton upon Trent to design a site to be built on the land and the now defunct site was largely based on the buildings erected by them in 1861 when they moved out of the old bake-house. In 1875 William Hardy sold his share in his brewery to his brother Thomas. Stephen Hanson who had purchased property on the opposite side of the road in 1846 built up Hansons Limited on Brewery Street, also using water from the Alley Spring. On his death in 1861 the business was carried on by his wife Mary and son Robert Hanson. Robert took control of the brewery and for some time there was keen competition between the two brewing companies who proceeded to buy pubs throughout the area to supply with their own ales. However, life became more difficult when both breweries began to run short of water. By agreement the water from the local Holly Well spring was shared between them. The supply of excellent brewing water from the Holly Well served both breweries well and they thrived independently until 1930, when under increasing pressure from larger brewing companies and lack of male successors to the Hardy's Brewery, the two companies combined and all brewing was concentrated at the Hardy’s site in 1932. The company name was changed to Hardys & Hansons in 1972. Greene King acquired the brewery in 2006 and brewing ceased in the same year. Most of the buildings on the Hansons site were demolished in 1973, although the majority of this significant site lies within Kimberley Conservation Area, and the 1861 maltings were listed Grade II in November 2008. In the Records of the Borough of Nottingham there are many references to the brewing industry and evidence of this can be found in the caves below Broad Marsh Shopping Centre. At the end of the 18th century there were three wholesale breweries in Nottingham; one on Goose Gate, one at Poplar Place and one at the north end of Leen Bridge. Brewhouse Yard, Nottingham derived its name from the site of the malting-offices and brewhouse of the castle. Probably the most remembered of the Nottingham breweries is James Shipstone and Sons Ltd, Star Brewery, Basford, Nottingham. In 1852 the first James Shipstone opened the brewery and remained in sole charge for over thirty years. Shipstone originally began brewing using premises at the maltings in Beeston by the side of the railway. The company's offices and brewery were later to be based at the 7-acre Shipstones 'Star' Brewery in the New Basford area of Nottingham. 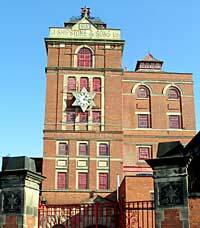 The brewery earned the nickname of 'Star' brewery because of the distinctive red illuminated star which stood at the top of the brewery's tower. When the brewery was started there were about 4000 people in the district and James must have realised that his market would be in and around Nottingham and there was good road and rail access. We can see the importance of the brewery in the area when in 1878 it was decided to build houses on Shipstone Street near to the brewery. The older Horse and Groom Inn, adjoining the brewery is thought to be Shipstone’s first tied house. In 1880 his eldest son, also named James, was taken into partnership, followed by his brother Thomas and the name of the brewery was changed to James Shipstone and Sons. After the death of James senior in 1897 the brewery continued and took over the Carrington Brewery. In 1922 James junior died and his two sons joined forces with Thomas to expand the brewery taking over Beeston brewery and William Hooley Limited. Beeston brewery was converted into maltings in 1924 and 1925Thomas was later knighted and became a magistrate and governor of the General Hospital in Nottingham. He died in 1940. At the onset of the Second World War James, the grandson of the founder took control of the company. The company remained an independent family business until 1978. It was taken over by Greenall’s of Warrington and in 1989 production of Davenport and Wem beers, which was owned by Greenall Whitley was transferred to Shipstones but in 1990, Greenall's announced that they were ending all beer production at Shipstones Brewery which was wound up ended in early 1991 after 139 years. The Shipstones brand continued to be produced for some years afterwards at breweries in Burton on Trent but this too finally came to an end in 1999. Brewing tower at the Star Brewery, New Basford, Nottingham. 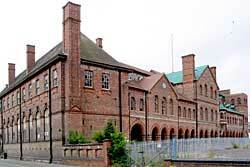 The landmark Victorian building, Shipstone’s Star Brewery built in 1900 and designed by William Bradford, with its later extensions closed in 1990 and continues to be used as a business centre; it is now known as James Shipstone House. The office building at the south end of the site has a lavish wood-panelled interior. All the brewery buildings stand within the Star Buildings Conservation Area. One of the company’s outstanding attributes as well as its beer was the horse drawn drays which were seen around Nottingham until nearly the 1960s. The ‘Shippo’ drays were always associated with the company. During the First World War many of the horses were conscripted and sent abroad and unfortunately only a few came back. By 1959 there were only 29 Heavy Shires left working for the company. The other major brewery in Nottingham until the 1970s was Home Brewery Company Limited, Daybrook. The father of the founder of the company was Thomas Robinson, a prosperous Arnold farmer who had an interest in malting. At the time of his death he held over 1000 acres, was married to Alice Parr and had six children. At the death of his father, the youngest son, John Daniel, who had received a good education, took over the maltings business and half the farm. He purchased more land and built a maltings which was to be the start of his fortune. More land was purchased across the Mansfield Road and in 1875 he and his brother opened the Daybrook Laundry. They saw the need for large scale service and leisure industries, as well as the laundry, to cater for the burgeoning middle classes. In 1877 the John Robinson Brewery was created, and later in 1890 he took the name from his farm, Home Farm in Bestwood to change the name to the Home Brewery Company. The brewery was developed into a large modern brewery and took over W H Hutchinson and Sons and George Green. Such was the success of the company it allowed John Robinson to purchase Worksop Manor from the Duke of Newcastle in 1890 and bought Thurgaton Priory for his son, John Sandford Robinson, who died prematurely in 1898 and had laid the foundation stone for a set of twelve almshouses near to the brewery in 1889 and they later became a memorial to him. John senior, like many of his peers had gone into politics; he became Guardian for the Radford Union; he served on the Nottingham Town Council for 20 years; became Sheriff of Nottingham in 1888 until 1896. After a period of mourning for his son he took on the ceremonial role of High Sheriff of the County of Nottingham and in 1905 he received a knighthood. The brewery remained independent until 1986 when it (along with its 450 owned public houses) was purchased by Scottish & Newcastle for £123million. Scottish & Newcastle gradually ran down production, for example subcontracting Mild brewing to the rival Mansfield brewery. The possibility of the closure of the Daybrook building was a concern for Gedling MP, Andrew Mitchell, whose constituency covered the brewery site, met with senior managers to discuss developments in November 1994. The brewery closed in 1996. The Home Ales building is now owner by Notts County Council. The building has an unusual ‘putti frieze’ by sculptor Charles Doman along the front wall which depicts groups of cherubs involved in the brewing of beer. Three designs are repeated in an ABCABC / CBACBA pattern. The reliefs are in a 2:3 proportion and are white casts. They depict A: a drinking table; B: barrel making; C: stirring the brew - all allegories of the brewing process. The decorative ironwork gates are contemporaneous. The original Nottingham Brewery founded at 52-56 Mansfield Road, Nottingham, can be traced back to 1847 and after several changes in 1879 it was bought by Edward Wheeler Field. It became a registered company in 1887 and reputedly owned several public houses some of which are still serving beer today, for example, Sun Inn, Gotham, the Charles Napier, Nottingham, Vernon Hotel, Basford and the Plough at Radford which is where the present Nottingham Brewery operated from. The premises were completely rebuilt in 1887 using a handsome Grecian design by William Bradford of London. The company obviously was doing well as it acquired the Wellow Brewery Company, Grimsby as well as 19 tied houses and continued to operate until 1944 where it was then used as a depot for Nottingham. The brewery became an established company in Nottingham and even gained world wide acclaim for transporting its India Pale Ale to troops of the British Empire around the world. The company was fortunate to have beneath it a warren of sandstone cellars where the beer could be stored at an ideal temperature of 56 degrees F. It was also fortunate that when the Great Central railway (where the Victoria Centre is today) was completed in 1890 the Victoria Station was very close by and a link was made to connect the brewery caves to the station allowing the easy transport of barrels and bottles onto the railway thus enabling their distribution around the country.The company kept producing beer up until 1944 when it was taken over by Tennant Brothers Ltd, Sheffield and finally wound up in 1956. When war broke out Nottingham Solicitor Charles Rothera said on 8 August 1914, 'Unless steps are promptly taken to stop brewing and distilling it is inevitable that large quantities of valuable food material will be irretrievably wasted…it ought to be conserved for the preservation of our 4 footed pigs than to provide a luxury for human beings.' He even suggested that 'Cheers' should be prohibited. Regulars in Nottingham’s 370 pubs would doubtless have disagreed. The government was so concerned an gave powers to licensing authorities to curtail drinking hours to a maximum of 6 hours a day with a mandatory afternoon break. On 5 January 1915, pubs in a 3 mile radius from the city centre were ordered to cut their hours and close the doors at 9.30pm. There were cries from the Nottingham and Notts Licensed Victuallers and Beer and Wine Association, saying that sale of beer had already fallen from 40% to 60%, and that drunkenness had gone down and the police returns showed this. Nevertheless with The Chancellor David Lloyd George a strong supporter of temperance, hours were reduced and higher duties and lower production came into being throughout the war years. Unfortunately during the 1960s and 1970s many of the well established breweries of the city and county were acquired by the conglomerates such as Courage, Greenall Whitley, Scottish and Newcastle. This was the death knell for the unique, individual brewers of the county and for the next twenty years many drinkers had to contend themselves with mass produced uninspiring beer. So what has happened with the brewing industry in Nottinghamshire? Well at the time of this entry there are over 30 micro breweries in the county producing real ale: fifteen alone have opened up in the past 12 months. Probably the largest of these is Castle Rock Brewery, based in Nottingham. It was originally set up as a joint venture with Bramcote Brewery in 1996 and was producing about 10 barrels a week. The company continued until 2001 when the owners parted company and Castle Rock Brewery became the official name of the company with their brewery tap pub the Vat and Fiddle on Queens Bridge Road, Nottingham. They were the brewing side of a company Tynemill which also owned pubs in and around Nottingham. The name of the brewery is taken from its position to Nottingham Castle and the rock that it stands on. By 2009 it was producing 100 barrels a week but today is at maximum capacity of 360 barrels a week. There are 23 staff employed by the company and the beer is sold through the 20 pubs owned by the Tynemill group as well as through other pubs. The beers produced are a mixture of traditional and balanced beers which has won the company numerous prestigious prizes at local and national beer festivals. They are at present setting up a competition to find the Champion beer of Nottinghamshire and a scheme ‘New Brew’ which will showcase as many of the local breweries who wish to take part. They have a selection of regular beers including Screech Owl which is named in conjunction with Nottinghamshire Wildlife Trust; Sheriffs Tipple; Harvest Pale (winner of the Champion beer of Great Britain title in 2007) and Elsie Mo, named after the malt it is made from, low colour Maris Otter. They also brew each quarter a beer which is named after a son or daughter of the county and has included Alan Sillitoe, George Green, Harry Wheatcroft and Harold Larwood. There was good news for the Nottingham Brewery when Bramcote and Castle Rock brewery owners parted company in 2000 because by that time Whitbread had given the name of Nottingham Brewery up and the new owner was able to take it on and begin brewing using some of the original breweries’ recipes. The brewery tap is at the Plough on St Peters Street, Radford. There are 8 members of staff and the beers are sold through over 60 pubs on a regular basis. The beers are traditional bitter and mild and a bottled Extra Pale Ale. Some of the names of the beers are original names such as Rock, Dreadnought and Bullion but others are modern such as Legend (after Robin Hood) and Real Ale a specially commissioned cask ale for the Broadway (Nottingham’s only Independent city-centre cinema complex). The company has won a substantial number of awards for their beer and they now appear on the ‘Cask Marque’ APP. The Blue Monkey Brewery, Giltbrook began in 2008. It was set up by its present owner who wanted a career change. In the beginning it was a small enterprise established near to Ilkeston. The company gets its name from the Stanton Iron Works where the owner’s grandfather operated a furnace and the blue flames emitted from the chimneys were known locally as Blue Monkeys. It employs eight staff, some of whom were originally employed by Hardy Hansons, Kimberley Brewery, before it closed down. All the beers are named using monkey puns. They have two pubs both called the Organ Grinder, one in Nottingham and the other at Loughborough. They are working at full capacity producing 15,000 pints a week either hand pulled cask and 15% bottled beers. Their beer has moved away from the old Hardy Hanson varieties to a more progressive paler, more hoppy beer. In October 2012 they won Champion Beer for the Midlands and Champion bottled beer, beating a competition of 800 at the Nottingham Beer Festival. North of the county there are small breweries of some note. Springhead Brewery began in 1990 at Sutton on Trent, near Newark and was the smallest brewery gaining a place in the Guinness Book of Records. It has grown both in capacity and popularity and moved to larger premises in 1993 and was the largest independent micro-brewery in 2003 brewing 50 barrels. In 2011 it relocated to new premises in the village of Laneham, near Tuxford, Nottinghamshire. Once again many of the beers produced have some connection with historical events, such as Barebones, named after the Barebones parliament in 1653; Black Tom after Thomas Fairfax, 3rd Lord Fairfax of Cameron, who was Commander in Chief of parliamentary Forces in English Civil War. The company sells the beer through its own pubs including the Bees Knees in Laneham, the Bramley Apple in Southwell and the Vine Hotel in Newark as well through other outlets in a radius of 100 miles. A glance through the ‘Nottingham Drinker’ shows how popular the micro-brewing industry has become with breweries such as Funfair Brewery, Elston, Caythorpe Brewery, Kings Clipstone Brewery, Newark Brewery and the Dukeries Brewery to name but a few. So despite the collapse of the ‘big breweries’ in the 1970s, brewing in Nottinghamshire has carried on a pace and there is a wide choice of beers to suit everyone. Brewing experts at the University of Nottingham’s Sutton Bonington campus are helping 20 micro-brewers across the East Midlands to develop bottled conditioned beers that can be sold in China and south-east Asia. The £25m Bioenergy and Brewing Science building opened in 2011 at Sutton Bonington. Concern with brewing goes back a decade or more, when Katherine Smart was appointed as the first professor of Brewing Science. Appropriately a special beer was brewed in the building’s state-of-the-art micro-brewery to commemorate the opening of the new facilities. The brewing interest links well with bio-energy work at Sutton Bonington which include the Food and Biofuel Innovation Centre as well as the SAB Miller Research Brewery. The SABMiller Chair of Sensory Science and Head of Brewing Science at Sutton Bonington, is encompassed within the School of Biosciences. See the Nottingham Post website for further details.